The Bhakti movements is basically based on theistic devotional trend in medieval Hinduism. In this time there are several saint came and sing or write various poem or article on Hindu God. This section contain various types of objective questions and answers on Bhakti Movements i.e. 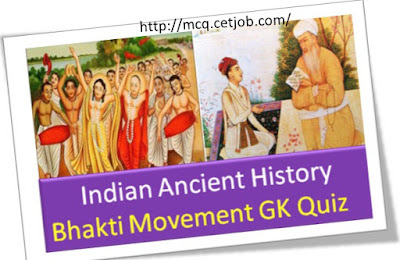 Ancient India Bhakti Movement Questions. Such types of questions frequently asked in various entance exams like SSC, Vyapam, PSc, UPSC, Railway, TET, CET etc. 1. Who among the following Bhati Saints was responsible for founding many punyakshetras along the length and breadth of India, by taming avatars of Parvati and imprisoning her essence in Sri Chakras? 2. Who among the following Bhakti Saints was part of the egalitarian, personalized Varkaridevotionalism tradition? 3. Who among the following was the reformer and philosopher from Ramanandi Sampradaya in the lineage of JagadguruRamanandacharya renowned for his devotion to the Lord Shri Rama? 4. Who was the the founder of the Ramanandi Sampradaya, the largest monastic Hindu renunciant community in modern times? 5. Who among the following was born into a Rathore royal family of Kudki district of Pali, Rajasthan and was a 16th-century Hindu mystic poet and devotee of A. Krishna? 6. Which Bhakti Saints venerated in Sikhism, as well as Hindu warrior-ascetic traditions such as the Dadupanthis and the NiranjaniSampraday that emerged in north India during the Islamic rule? 7. Which Bhakti Saints writings influenced Hinduism's Bhakti movement and his verses are found in Sikhism's scripture Adi Granth? 8. Which ascetics of the Yoga school of Hindu philosophy influenced the Ramananda? 9. Which of the following Bhakti Saints Krishna is a yogi and lover? 10. Who was the writer of Rukmini SwayamwarHastamalak, which was comprised 764 owees and based on a 14-shlok Sanskrit hymn with the same name by Shankaracharya? 11. Who exhorted people to give up selfishness, falsehood and hypocrisy and to lead a life of truth, honesty and kindness? 12. Who among the following propagated Dvaita or dualism of Jivatma and Paramatma? 13. Who among the following preached gospel of love? 14. Which of the following Bhakti Cult preached under the Pallavas, Pandyas and Cholas? 15. Which saint and reformer of Bengal who popularized the Krishna Cult? 16. Which of the following aspect of Bhakti Movement was common with Sufism? 17. Which of the following Bhakti saint of Maharashtra responsible for creating a background for Maratha nationalism and also opposed all social distinctions? 18. Which of the following Bhakti Reformers influenced by the preaching of Sufi teachers? 19. Who wrote a commentry of Bhagvat Gita called Gnaneswari? 20. The concept of Sagunabrahmana was the outcome of which concept of Bhakti Movement? 21. Who among the following propagated Dvaita or dualism of Jivatma and Pramatma in Kannada region? 22. Which of the following is related to the concept of Nirgunabrahman? 23. Who was the founder of the Bhakti Movement in Maharashtra in 13th Century? 24. Consider the following statement (s) related to the Bhakti Saint Ramanuja I. He preached Visishtadvaita. II. He said that the ‘God is Sagunabrahman’. Which is/are correct statement (s)? 25. The SaivaiteNayanmars and Vashanavaite Alwar preached the Bhakti Cult under which of the following rulers? 26. Consider the following statement (s) related to the Bhakti Saint Chaitanya I. He popularised the Krishna Cult in Bengal. II. He believes that through love and devotion, song and dance, a devotee can feel the presence of God? Which is/are correct statement (s)? I. He advocated prabattimarga or path of self-surrender to God. II. He propagated ‘Dvaita or dualism of Jivatma and Paramatma’. Which is/are correct statement (s)? 28. Who among the following Bhakti Saint said that “Abide pure amidst the impurities of the world”? 29. Bhakti Saint who was contemporary of Sivaji? 30. Who was among the following Bhakti saints gave a new orientation of Hinduism through his doctrine of Advaita or Monism? 31. Which of the following is an intensely emotional form of Hinduism that flourished from the sixteenth century, mainly in Bengal and eastern Orissa? I. Bhakti Movement resulted in a surge in Hindu literature in regional / vernacular languages mainly in the form of devotional poems and music. II. Bhakti Movement resulted in a surge in Buddhist text in regional / vernacular languages mainly in the form of devotional poems and music. I. KaraikkalAmmaiyar, a devotee of Shiva, adopted the path of extreme asceticism in order to attain her goal. II. Andal and KaraikkalAmmaiyar renounced their social obligations, but did not join an alternative order or become nuns. Which of the following statement(s) is/are correct about the women devotees of the period? I. In the course of the evolution of forms of worship, in many instances, poet-saints emerged as leaders around whom there developed a community of devotees. II. Brahmanas remained important intermediaries between gods and devotees in several forms of bhakti. III. At a different level, historians of religion often classify bhakti traditions into two broad categories: saguna (with attributes) and nirguna (without attributes). Which of the following statement(s) is/are correct about the early traditions of Bhakti? I. Alvars and Nayanars initiated a movement of protest against the caste system and the dominance of Brahmanas or at least attempted to reform the system. II. Alvars and Nayanars always supported the caste system in the society. III. The importance of the traditions of the Alvars and Nayanars was sometimes indicated by the claim that their compositions were as important as the Vedas. Which of the following statement(s) is/are correct about the attitudes of Alvars and Nayanars towards caste system? 36. Which of the following statement is correct definition of Nirguna? A) It is the concept of a formless God. B) It is the concept of a formless Guru. C) It is the concept of spirituality. I. Some of the earliest bhakti movements c sixth century) were led by the Alvars (literally, those who are “immersed” in devotion to Vishnu) and Nayanars (literally, leaders who were devotees of Shiva). II. They travelled from place to place singing hymns in Tamil in praise of their gods. III. During their travels the Alvars and Nayanars identified certain shrines as abodes of their chosen deities. Which of the following statement(s) is/are correct about Alvars and Nayanars? 38. Which of the following statement (s) is correct about Alvar Saints? A) The twelve Alvars were Tamil poet-saints, who lived between 6th and 9th centuries AD and espoused ‘emotional devotion’ or bhakti to Visnu-Krishna in their songs. B) The 63 Alvars saints were the Shiva devotional poets, who lived between 5th and 10th centuries. A) Collection of Alvar Saints hymns is known as DivyaPrabandha. B) Compilation of Alvar Saints poetry / literature Tirumurai is called “Tamil Veda”.